We bought him a crib/playpen but he rarely slept there. He would always wake up whenever we try to put him down his crib. There were lucky instances wherein he would sleep in his crib but that's very rare. Co-sleeping is also very convenient for a nursing mom like me because I get to feed my baby while on the side-lying position. We're both comfortable that way. He's now 16 months, the crib has long been gone from our room, and we've been co-sleeping happily with our son. I love co-sleeping with him. I can feel him beside me, I can smell his baby scent and I can touch his soft skin. 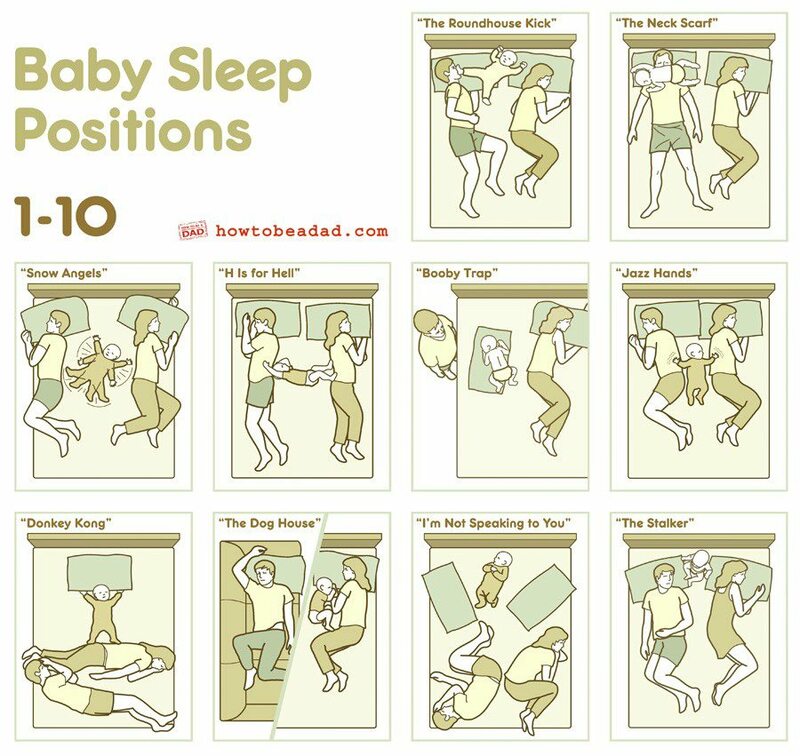 That's when he doesn't do any of the sleeping positions below. Haha! No, just kidding. I don't mind if he does positions like the "Snow Angels" or the "Roundhouse Kick". I just love sleeping beside my baby (and my hubby too of course!). I did have a good laugh myself because my husband and I have experienced all that's shown in the picture. Pretty amusing, huh? I find "The Stalker" really funny, though. Haha! How about you? Are you practicing co-sleeping too? In the morning, I usually find the baby on my tummy trying to get to the other side. The H usually happens to us and the neck scarf to her dad. hahaha! that was a cute post! =) Saw me and my husband in some of the positions. But soon I think co sleeping is not entirely good for the marriage, well same with long distance but what the heck right? The Roundhouse kick and the stalker are so funny! I'm co-sleeping with my 17-month-old and her elder sister. The daddy stays on the mattress on the floor with our second. The stalker is really funny, right? :-) Thanks! I was laughing while looking at the picture I also co-sleep all my children (8, 6, 1) until now. kawawa nga iyung daddy kasi siya yung ang "outsider" lagi. We were like this when we only have Julia. But now that we're a family of 4, we're scattered everywhere LOL! It would really be a pity if either you or your husband would unconsciously roll over your baby. But I think the mother will be more patient than the father when it comes to this. SM Homeworld Sale Is On! J. Co Donuts: The Long Queue! How Much Is A Stay At Home Mom's Work Worth? My 10 Random "New Mom Must-Haves"
Look What's Coming Soon at SM North Edsa! "So Undercover" Movie Screening Winner! Simple Joys Photo: Nappy Changing "Battle"
Simple Joys Photo: Trev and his "Toy Mess"